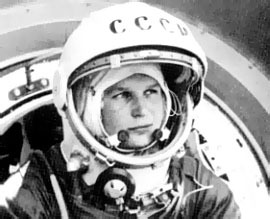 Fifty years ago today — June 16, 1963 — Vostok 6 carried Soviet cosmonaut Valentina V. Tereshkova to orbit from the Baikonur Cosmodrome. As noted, Tereshkova was the first woman in space. The Vostok 6 mission was the last in the Soviet Union’s first series of manned spaceflights, and lasted for three days.